Ok… What are Tenerumi? They are the mild and tender leafy greens from the cucuzza plant. A cucuzza plant produces pumpkin or squash. 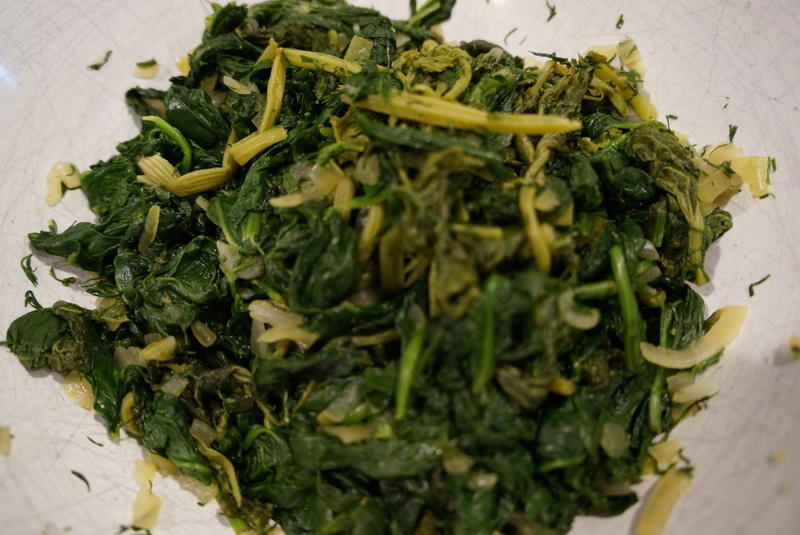 The leaves or tender greens of the plant are very popular in Sicilian cuisine – a staple if you will. Finding them can be challenging unless you go to Jean-Talon Market or have a Sicilian aunt like mine who grows them in her garden. Zia Pina, who is actually my great-aunt, who is incidentally also great 🙂, was kind enough to share some with us. She is our family’s primary resource for Sicilian cuisine. She keeps the classics alive and without her, we’d be lost. So, I had a large bunch of Tenerumi which were cooked down to just under 2 cups. 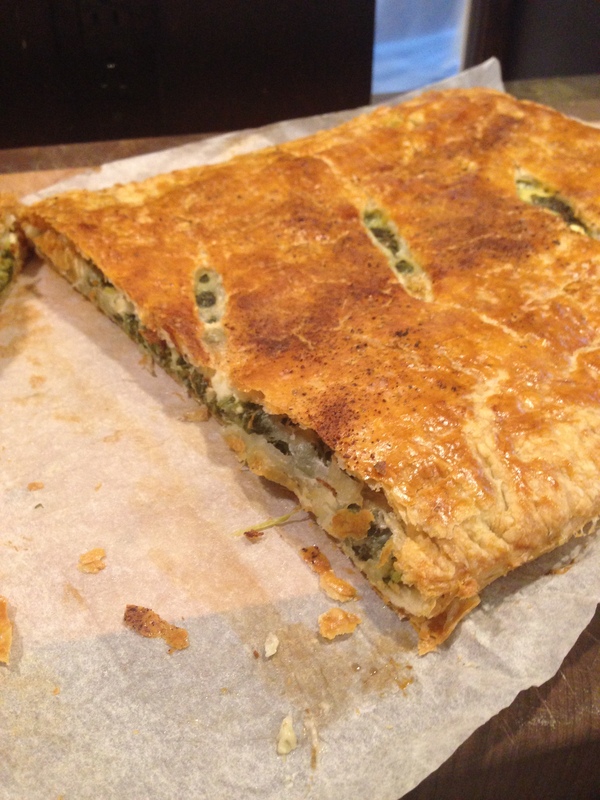 I also had two bags of fresh spinach so I thought I’d combine the two to make an altered version of Greek spinach pie (Spanakopita). 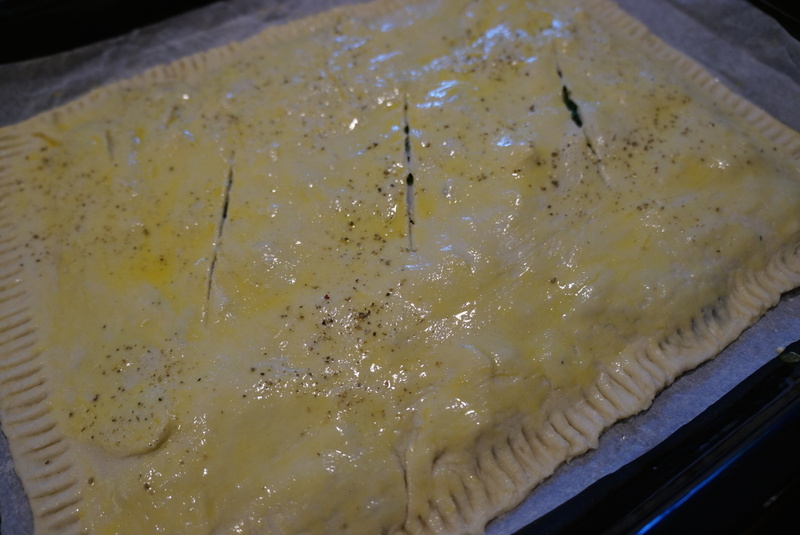 I did not have phyllo (filo) dough so I used puff pastry instead. It worked out beautifully. Snap off the leaves, tender stems and tendrils, discarding any tough stems and overly large or yellow leaves, and put them in a basin filled with water and wash thoroughly. Add some salt to the boiling water, put in the tenerumi, simmer until tender but still bright green in colour. Drain and set aside. 2 x 285g bags of fresh spinach, tough stems discarded, washed and drained. About 1/4 lb of feta cheese , crumbled – preferably Greek feta (fine-textured and less salty) Certain Canadian, ready packaged brands tend to be crumbly and too salty. Heat a large frying pan on medium heat. Add 1 tablespoon of olive oil to the pan. Sauté the onion until softened. Add chopped dill and combine until wilted slightly. Add all the drained greens to the pan. The spinach has a lot of volume but will cook down dramatically. Just carefully fold it over itself until wilted and combined thoroughly with all ingredients. Remove greens from heat (drain out any excess liquid) and set aside to cool. Meanwhile, in a medium bowl, combine the two beaten eggs with the crumbled feta – thoroughly coating it. Put the mixture in the refrigerator to keep cool. On a lightly floured surface, unroll your pastry sheets and gently roll them out for a slightly larger surface area. Place one pastry sheet onto your prepared cookie sheet. 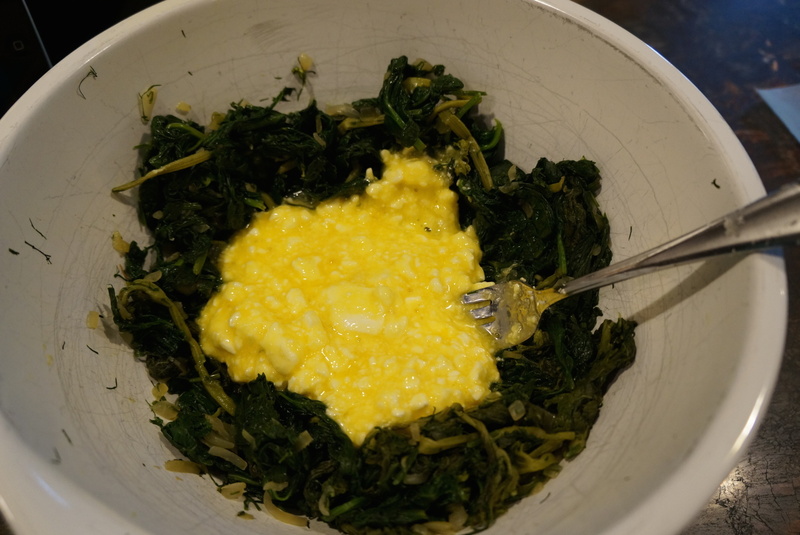 Combine cooled greens with egg/feta mixture, again making sure all is coated. Lightly brush egg wash onto the bare border. Next, place your top sheet over the pie. Seal your pie by crimping the edges with a fork. Brush egg wash over the top of the pie only, avoiding sides and edges. Sprinkle the top of your pie with salt, pepper and nutmeg. Cut 3 diagonal slits into the top of your pie for venting. The nutmeg is a necessary addition in my opinion as it adds another facet of flavour to your pie – completing and rounding it all up. Bake for 35-40 minutes, until golden. I am making this tomorrow night! Looks delicious!! Awesome!! Do you have Tenerumi or are you using another green?